A false dawn? Or have Mercedes really got a fight on their hands? Everything appears to be set up for an interesting weekend under the lights. You can read Andrew Benson's report here and we shall be back 10:30 BST sharp on Saturday for coverage of final practice and qualifying. Until then. Red Bull's Daniil Kvyat finishes fastest in second practice for the Singapore Grand Prix. Both Sebastian Vettel and Daniil Kvayt dipped into the 1:50s on their long runs, something Lewis Hamilton didn't manage to do. A closely-fought battle on the cards? Or are the cards being kept close to Mercedes' chest? Quote Message: I've asked Mercedes what happened with Rosberg at Turn 18 and they said nothing untoward. He just carried on. They brought him in for a set of soft tyres and sent him back out." I've asked Mercedes what happened with Rosberg at Turn 18 and they said nothing untoward. He just carried on. They brought him in for a set of soft tyres and sent him back out." Into the final five minutes of the session and Daniil Kvyat tops the timesheet ahead of Kimi Raikkonen, Daniel Ricciardo and Lewis Hamilton. Nico Rosberg is down in seventh. "Check that things aren't too hot," Nico Rosberg says over team radio. "Engines temps are OK Nico," comes the reply. Yellow flags as Nico Rosberg, on worn supersoft tyres, heads down an escape road at Turn 18. Lewis Hamilton had been lapping consistently in the 1:51s but the performance is perhaps just starting to drop away as his 17th lap on the supersoft tyre is a 1:52.741s. Alexander Rossi's first timed effort in FP2 is a 1:57.390 on the supersoft tyre, putting him in P19. Can Hamilton be compared to Senna? "OK Daniel, pace looks good, degradation is very good," Daniel Ricciardo is told over team radio. A good session for Red Bull so far. Twenty minutes left and Alexander Rossi emerges for the first time in FP2. Daniil Kvyat, who looks set to top the timesheet today, is showing good pace on his long runs as he clocks a 1:51.6 on his 10th lap on the supersoft tyre. Could Mercedes have a fight from the Red Bulls on their hands this weekend? Lewis Hamilton's last lap - his ninth on the supersoft - was a 1:51.335 while Daniel Ricciardo, also on long runs, is round in 1:41.546. "Revised lap time target high 51." It doesn't look like Lewis Hamilton will finish Friday on top of any of the practice sessions as his focus appears to have switched to long runs. Quote Message: "It is starting to rain down here. There are spots of rain in the pitlane. Meanwhile Felipe Nasr has picked up a reprimand for failing to come on track at the right point in FP1." "It is starting to rain down here. There are spots of rain in the pitlane. Meanwhile Felipe Nasr has picked up a reprimand for failing to come on track at the right point in FP1." Meanwhile, it has been a good day so far for McLaren, with both Fernando Alonso and Jenson Button getting plenty of running without any major drama. Alonso has the eighth fastest time at the moment with 1:46.959, while Button is 14th fastest with 1:47.888. Quote Message: "It looks as though Kvyat went out again on the supersoft and managed to go more quickly on that original set of supersofts. Hamilton meanwhile has just gone back out on circuit. So is he going out on a long run, or is he, like Kvyat, going out to see if he can find more pace?" "It looks as though Kvyat went out again on the supersoft and managed to go more quickly on that original set of supersofts. Hamilton meanwhile has just gone back out on circuit. So is he going out on a long run, or is he, like Kvyat, going out to see if he can find more pace?" Daniil Kvyat has turned his Romain Grosjean anger into speed as he goes fastest of all with a 1:46.142. Kimi Raikkonen drops to second, while Daniel Ricciardo is now third. Quote Message: "Kimi Raikkonen does not like simulators but after he made that error at the start of the last race he went and did 100 practice starts on the simulator. That is how motivated he is. A few years back I don't think he would have done that, but he really wants to make this work at Ferrari." "Kimi Raikkonen does not like simulators but after he made that error at the start of the last race he went and did 100 practice starts on the simulator. That is how motivated he is. A few years back I don't think he would have done that, but he really wants to make this work at Ferrari." Lewis Hamilton's second go on the supersofts seems him split the Ferraris, a 1:46.479 putting him around three tenths of a second off Kimi Raikkonen's benchmark. Meanwhile, a hair-raising moment for Daniil Kvyat as Romain Grosjean gets in his way and Kvyat hits the brakes, before raising his hand in frustration. "BEEP. BEEP," is the sound over team radio as Kvyat embarks on an expletive laden rant against Grosjean. Lewis Hamilton's first lap on the supersoft tyres sees him off at Turn 1 and he has to back off his lap. He's having another go now. Meanwhile, Nico Rosberg's first run on his qualifying sim seems him go third fastest with 1:46.781. With Lewis Hamilton bidding to equal Ayrton Senna's record of 41 wins from 161 starts this weekend, we are asking if the two can be compared, and if Hamilton can be considered an F1 great. No he can't. Second fastest for Sebastian Vettel, three tenths of a second down on his Ferrari team-mate. Felipe Nasr, also with supersoft shoes on, goes sixth fastest with 1:47.755, but here comes Sebastian Vettel on his first run on the supersofts. Can he move into P1? Kimi Raikkonen's first effort on the supersofts is a 1:46.181, 1.3s faster than the time Lewis Hamilton set in FP2 last year. Everyone is back in the pits to make the switch from softs to supersoft tyres. Kimi Raikkonen is the first to get the new compound bolted on and is swiftly back out on the circuit. Away from Carlos Sainz-related shenanigans, Lewis Hamilton has gone fastest with 1:47.633, 0.026s faster than Kimi Raikkonen. Daniil Kvyat is third fastest. Don't forget you can listen to commentary on second practice via the 'live coverage' tab on mobile, or by clicking the audio icon button at the top of this page if you are following on desktop computers. It looks like Carlos Sainz just kissed the wall at Turn 5. Could that have been the cause of the puncture? Ah, puncture on the left rear of Carlos Sainz's Toro Rosso and he limps back to the pits. Kimi Raikkonen is up into P1 with a 1:47.659. He leads Daniel Ricciardo, Lewis Hamilton, Nico Rosberg and Daniil Kvyat. Vettel turns the air blue as he vents his anger at his team after feeling he was released intro traffic. All go again on the circuit and Daniel Ricciardo soon goes fastest with 1:48.103, putting him ahead of Nico Rosberg and Lewis Hamilton. Eighteen of the 20 cars are out on track at the moment. Quote Message: "The general mood is one of great disappointment you feel at Manor. This team just want a bit of luck, they need a little something on their side and it has not happened so far. Roberto Merhi is sat up on the pitwall at the moment and I am wondering what he is thinking now. I bet you one million pounds it would be: 'I would not have done that'. "The general mood is one of great disappointment you feel at Manor. This team just want a bit of luck, they need a little something on their side and it has not happened so far. Roberto Merhi is sat up on the pitwall at the moment and I am wondering what he is thinking now. I bet you one million pounds it would be: 'I would not have done that'. Will Stevens is out of the Manor and the car is lifted off the circuit, with the little bit of debris that was there swiftly swept away. We should be back up and running very soon. As Andrew Benson told us earlier, Alexander Rossi is not going out until later in the session so this red flag is for the Manor of Will Stevens, who loses the back end of his car and slides into a barrier at Turn 12. "Lotus were in court this morning, fighting to stave off administration in a case brought by Britain’s tax authorities. The judge upheld Lotus’s request for adjournment, giving them until 28 October, the day after the Japanese Grand Prix to resolve the issue, saying this would be the final adjournment. Off we go then. Ninety minutes of second practice and Daniil Kvyat, who only managed eight laps in FP1 one because of a fuel system issue, is straight out on to the circuit. Lewis Hamilton is in rush. He is having a chat with Pharell who, you'd imagine, will have met him before when Hamilton has been on his travels. “Alexander Rossi had a baptism of fire in first practice, crashing the Manor at Turn 18 close to the end of his first session of what will be his first grand prix, after being drafted in to replace Roberto Merhi. Pharell has just popped into the Mercedes garage for a very brief chat with Nico Rosberg, who then heads off to get himself ready for second practice, which is about five minutes away from getting under way. While Sebastian Vettel will be hoping to challenge Lewis Hamilton for victory this weekend, the two have also been battling for a very different title...least convincing waxwork lookalike. The above recreations of the pair have been unveiled in Singapore this week. Not sure what to say really...Hamilton's hat looks good. "American Alexander Rossi had an unfortunate start to this career with Manor, who have drafted him in for five of the last seven races of the season in place of Spaniard Robert Merhi. "Rossi was doing well - with a fastest time of just 0.015secs off team-mate Will Stevens, who has driven the car all year - until he lost control and smashed into the barrier at Turn 18, doing considerable damage to the right-hand side of the car." It has just gone 9.05pm in Singapore and cars will be rumbling out on to the circuit for second practice in 20 minutes. Radio commentary will be available just before it starts online & at the top of this page. Hello and welcome to our coverage of second practice for the Singapore Grand Prix. It was a Mercedes one-two in FP1 with Nico Rosberg topping the times ahead of Lewis Hamilton, but Red Bull's Daniel Ricciardo was not far off the pace, lapping within around three tenths of Rosberg. Red Bull have won three of the last four races in Singapore, could they be the team to challenge Mercedes this weekend? It was a mixed first day at the office for debutant Alexander Rossi. After showing some good early pace in the Manor, the American, who has taken the race number 53 - the same as Herbie in the cheeky car caper films of the same name - smacked into a barrier late on, bringing out the red flag. Will Herbie ride again in second practice? So far so good for Nico Rosberg as he looks to cut into Lewis Hamilton's lead, but a long way to go yet. Disappointment for debutant Alexander Rossi, though, with that late crash. Will Herbie ride again for FP2? We'll find out at 14:30 BST. We are going to take a little break but will be back with live coverage from 14:00 BST. In the meantime, have a read of Andrew Benson's first practice report. Quote Message: "Rossi will be really disappointed with how that ended. Interesting to see Valtteri Bottas up there because Williams don't normally show their hand on Fridays. "Rossi will be really disappointed with how that ended. Interesting to see Valtteri Bottas up there because Williams don't normally show their hand on Fridays. Such a shame for Alexander Rossi at the end, having been pretty much as fast as his Manor team-mate Will Stevens. Just 0.015 between them. Nico Rosberg finishes fastest in first practice for the Singapore Grand Prix. That, you would imagine, is that with barely a minute left of the session when Alexander Rossi crashed. Roberto Merhi, replaced by Alexander Rossi for this weekend, makes a notable walk through the Manor garage. I wonder what he is thinking...? Oh so close to a trouble-free first outing for Alexander Rossi. Red flag. The American hit a barrier in the final sector and both tyres on the right side of his Manor are facing the wrong way. "I hit the wall," he says over team radio. Daniil Kvyat is heading back out to get in a couple of laps with Red Bull having fixed the fuel system issue that limited him to just five laps earlier in the session. Into the final 10 minutes and there is no change at the top of the order, with Nico Rosberg leading the way with the 1:47.995 he clocked a while back. Lewis Hamilton is second fastest, with Daniel Ricciardo third. Yellow flag is waved as Sebastian Vettel shoots down the escape road at turn five, having gone heavily over the kerb moments earlier. Pastor Maldonado is told of a potential reliability issue with the gearbox in his Lotus so time is called on his first practice session and in he goes to get the sandwich orders in early doors. Quote Message: Heat is an issue in Singapore and I have been watching Lewis Hamilton come past me in the pit lane. He tends to take his hands off the wheel and move them around a bit, and has even taken his glove off at one point. Heat is an issue in Singapore and I have been watching Lewis Hamilton come past me in the pit lane. He tends to take his hands off the wheel and move them around a bit, and has even taken his glove off at one point. With 20 minutes left, this is how things look on the timesheet. The appearance of the safety car has been a regular feature of past Singapore GPs and no doubt the owner of hasmaldonadocrashedtoday.com will be eagerly waiting to update their site this weekend. So far so good for Pastor Maldonado, though, as he has the 10th fastest time, although he did have a little moment when he ran very, very close to the barrier. It doesn't take long for darkness to fully descend over Singapore and the circuit is looking phenomenal under the lights at the moment. Apart from some cockpit and radio issues for Jenson Button it is so far so good for McLaren, with Fernando Alonso 10th fastest and Button in P12. Both have completed 14 laps, with Carlos Sainz having spent the most time out on track having completed 18 laps of the Marina Bay circuit. A slight gain for Nico Rosberg as he dips below 1:48 with a 1:47.995 to stay top of the timesheet. Lewis Hamilton is second, three tenths of a second slower, with Daniel Ricciardo third. Daniil Kvyat has got a timed lap under his belt, a 1:51.188 but he is still having some issues with his Red Bull. "Dany, for your information, we've aborted the run due to concerns about the fuel system," he is told over the radio. "Problem with the drinks tube," reports Nico Rosberg over the radio. That's something he'll be keen to be fixed swiftly with the air temperature 29C and humidity an uncomfortable 79%. Will the adjustments work for Jenson Button? He is back out on the circuit. Just over halfway through the session and the lights have popped on around then circuit, making the cars look very nice indeed. Alexander Rossi has plenty of company now with Lewis Hamilton, Nico Rosberg and several others have returned to the track. “It’s fair to say that if it had been known just how bad McLaren-Honda’s season was going to be, a number of people in F1 would have been expecting Fernando Alonso to lose it sooner or later. But the Spaniard - who, lest we forget, joined McLaren on a $40m salary with the express intention of winning a third title - has kept it together admirably well so far. And on Thursday he insisted yet again that he feels he made the right choice in leaving Ferrari, and that things will improve next year. He added: ‘It is a matter of trust and confidence. Last year I decided to stop with Ferrari and join McLaren. I did it basically because the project of the McLaren-Honda partnership will succeed sooner or later. Obviously the performance this year is a little lower than the expectations last year but to beat Mercedes you need to do something different. Either you are in a Mercedes car or you are frustrated. Quote Message: "Good news at McLaren, it is all calm on Fernando Alonso's side of the garage. We heard Jenson Button complain about being uncomfortable in the cockpit and a bit of work is going on at the moment. Jenson is not looking too frustrated at the moment, he is just watching the guys work and he should be back in the car soon." "Good news at McLaren, it is all calm on Fernando Alonso's side of the garage. We heard Jenson Button complain about being uncomfortable in the cockpit and a bit of work is going on at the moment. Jenson is not looking too frustrated at the moment, he is just watching the guys work and he should be back in the car soon." With 50 minutes left of the session, Nico Rosberg leads the way with 1:49.184, followed by Daniel Ricciardo, Lewis Hamilton, Kimi Raikkonen and Sebastian Vettel. Everyone has completed at least one timed lap so far except for Daniil Kvyat. He had reported a loss of power just now, but managed to limp the car back to the pits. Meanwhile, Alexander Rossi decides to return to the circuit as he continues to familiarise himself with both the circuit, and the car. It is just starting to go dark and that provides the opportunity for some fine shots of sparks flicking up from behind Rossi's Manor as he circulates the track. “What sort of a weekend will Williams have? On paper, it does not look that good. Singapore is a low-grip, slow-speed track and Williams have conspicuously not gone well on that sort of circuit this year - just look at Monaco and Hungary. This year has hardly been a disaster for Williams - they hold a solid third in the constructors’ championship and there have been some podium finishes, an excellent performance given they have half the budget of the big teams. But there is no escaping a sense of frustration - especially from Valtteri Bottas - that they have not been able to build as successfully on their progress last year as they would have liked. There is just the noise of the nearby traffic at the moment with everyone on the circuit having returned to the pits to hand back the first set of tyres. Just watching the onboard camera on Sebastian Vettel's Ferrari and it is shuddering about all over the place. Not because of his driving, this circuit is renowned for being bumpy and with 23 corners and a race that lasts for almost two hours, it is a real test for the drivers physically. The Red Bulls are keeping the pace with the Mercedes in this session as Daniel Ricciardo goes P2 with 1:49.596. Could they be in the fight this weekend? Nico Rosberg improves his pacesetting time with a 1:49.184, while Lewis Hamilton is back up into P2 after lap that was a shade under a second slower than Rosberg's. Daniel Ricciardo shoots up to third with 1:50.442. Nineteen cars out on the circuit at the moment. Plenty of timed laps filling up the timing board now. The Ferraris split the Mercedes as Kimi Raikkonen goes P2 with 1:51.314, with Sebastian Vettel 0.3s slower in P3. Speaking of Jenson Button, he says he will quit Formula 1 altogether if he does not stay at McLaren-Honda in 2016. Some radio issues for Jenson Button as he reports he can hardly hear what he is being told by McLaren. Plenty of of flow-viz splashed on the side of the Lotus. Nico Rosberg gets us up and running in Singapore with a 1:50.393s. His Mercedes team-mate Lewis Hamilton follows suit, but his first effort is four seconds slower than Rosberg's. Sauber have picked up points in each of the last three races through Marcus Ericsson and will be hoping for some success in Singapore, with a "significant" aerodynamic update introduced on their cars for this weekend. Everybody has been out for their installation laps, with Lewis Hamilton the last to venture out. No lap times set in the first 20 minutes. As Lewis Hamilton bids to equal Ayrton Senna's record of 41 wins from 161 starts, we are asking if the two can be compared, and whether Lewis Hamilton can now be considered an F1 great. “Lotus driver Romain Grosjean caused a bit of a stir on Thursday when he announced that he already knew what he would be doing in Formula 1 next year - but refused to say what it was. "‘I’ve got more information than you do, and with this information I’ve made my mind up. You will see me in F1 next year,’ he said. "The Franco-Swiss is under contract to Lotus, but the team’s future is in doubt as they continue to explore selling out to former owners Renault, who would obviously want to keep Grosjean on. Renault boss Carlos Ghosn said this week that the French car company would ‘either exit or run our own team - we don't have a clear decision yet’. The Singapore GP is a funny for drivers, team personnel and journalists. It currently around 18:00 local time, with second practice starting at 21:30 and nothing finishing until 23:00. The odd working times means most people elect to keep their body clock on European time given that they will end up working through the night. “It’s no secret that I love my sleep so one of the most important aspects of preparation for me is ensuring that my room stays dark in the morning," says Lotus' Romain Grosjean. The circuit is open and off we go with 90 minutes of first practice. Alexander Rossi wastes no time in getting out on the track, with Sebastian Vettel and Romain Grosjean also heading out. “In case this morning is your first hit of Formula 1 this week, there is a new driver on the grid this weekend after Manor decided to draft in American Alexander Rossi for five of the remaining seven races this season. "The 23-year-old, who holds second in the GP2 championship at the moment, admitted it had come as a bit of a surprise - he found out on Tuesday morning, booked his flight and was on the plane that evening. What are these? Shots from the upcoming Star Wars film? Nope, it is from Red Bull indulging in a bit of pit stop practice on Thursday, with the above picture a very arty shot of the pit-stop light in Singapore. This circuit must be a photographer's dream. Almost time for FP1 in Singapore, where it not dark yet as traffic streams on the roads around the circuit. Such an amazing sight, F1 cars whizzing around the track as people around them drive home from work. Commentary has just started now on BBC Radio 5 live sports extra. “Some information on Nico Rosberg which may or may not become important as the season develops. "Mercedes had originally planned for the German to run in Friday practice with the new engine they had to take out of his car after practice in Monza on precautionary grounds to see how it was. That plan was abandoned, and he now starts the weekend with another new engine - of the same upgraded specification that made such an impression in Italy. That means Rosberg has now used all his four permitted engines, and Lewis Hamilton still has a new one in the bag should he hit trouble. Nico Rosberg was all smiles on Thursday but how long that will last remains to be seen. With seven races left, he will need to start eating into Lewis Hamilton's 53-point advantage sooner, rather than later. "I have the chance to keep believing or not and I have chosen to keep believing because it is going to help for the next couple of races," said Rosberg. "Historically in sport anything can happen." There's been plenty of chat in the build up to this Sunday's race about a cloud of haze hanging over Singapore. It was caused by farmers in neighbouring Indonesia, but race organisers said earlier this week said they did not plan to amend the racing programme for this weekend because of it, and Jenson Button agrees that it should not be a cause for concern. "It rained on Wednesday and it was much clearer today (Thursday). It looks like it will be fine, so hopefully nothing for us to worry about," he said. BBC Weather's Ian Fergusson: "There should be a good amount of dry weather about this weekend. For Friday, it will be hot with temperatures up to 30C. It could well be one or two showers form to the south of Singapore, but I doubt they will affect the circuit." Can Lewis Hamilton be compared to Ayrton Senna? Or is it unfair to put drivers from different era alongside each other? If you don't think he is already, what does Hamilton need to do to be considered a Formula 1 great? Let us know via #bbcf1, text in on 81111 (UK only) or have your say on the BBC Sport Facebook page. That quote in my introductory entry, by the way, was taken from Lewis Hamilton's latest BBC Sport column where he discusses Ayrton Senna's record. "I am so proud to be in a position to emulate him," he writes. "At the same time, though, I am also aware that if he had not passed away he would have continued and won so many more races and championships, because he was that good. "Now I am at the stage where I am getting to the levels he was at, it feels a little like a relay race - that I will be picking the baton up for him and carrying it for the both of us from now on." Hamilton also gives some hard truths about F1, talks about the championship battle and reveals what it is like to race in Singapore. Read the full column here. OK then, here's your heads up for what is coming up in Singapore. First practice gets under way at 11:00 BST and runs for the usual 90 minutes. Then there is a break for a couple of hours to have lunch (or supper for those in Singapore where it will be around 8pm) before second practice starts at 14:30 BST. You can listen to live commentary on both sessions via BBC Radio 5 live sports extra. Time running out for Rosberg? “Mathematically, this championship is a long way from over - Lewis Hamilton leads Nico Rosberg by 53 points and, with seven races left, there are still 175 available. But reality is a different matter. "Hamilton would have to fall under a bus, or suffer some other similar mishap, to not romp home with a number of races to spare. The only doubt seems to be how many. Rosberg is still talking positively, saying he has ‘nothing to lose’ and will ‘never give up’. But he must know the game is up. Hamilton is doing to him - and the rest of the field - what Sebastian Vettel did to Mark Webber and the rest through Red Bull’s dominant era - invariably sticking it on pole and dominating the race from there. 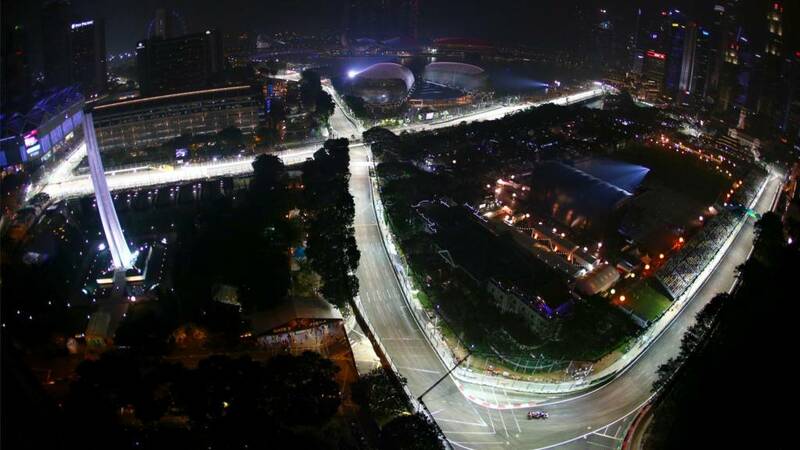 Hello and welcome to our coverage of first and second practice for the Singapore Grand Prix. The Formula 1 circus has left Europe behind to travel to the Far East for one of the most visually stunning races of the season. Lewis Hamilton arrives looking to further extend his lead over Nico Rosberg in the championship as well as make a little piece of history - equalling Ayrton Senna's record of 41 wins in 161 starts. "I wanted to be like him. I aspired to one day drive the way he drove, and achieve something similar to what he achieved." Growing up, Lewis Hamilton was inspired by Ayrton Senna. He wanted to race like him. Behave like him. Basically emulate him.